Lady Speed Stick Nutra-Skin keeps you dry AND moisturized - crazy right?!? 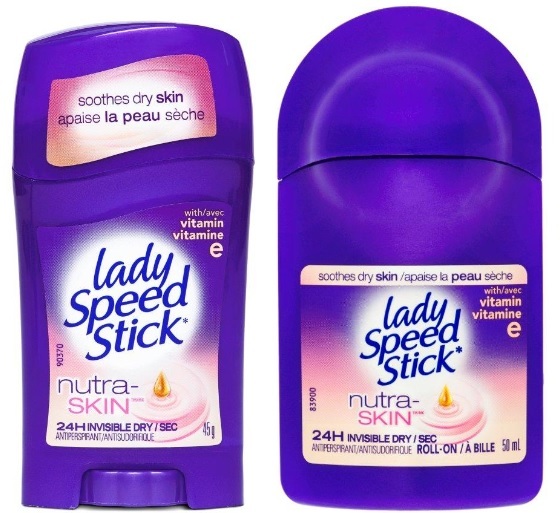 Lady Speed Stick Nutra-Skin Antiperspirant - $2.99 - in both a solid and roll-on with an invisible formula that contains over 30% skin conditioning agents including Vitamin E to nourish your delicate underarm skin but still with extra-effective 24 hour wetness protection so there is no need to sacrifice the protection you need and expect from your anti-perspirant. I must admit that deodorant is not something I generally put a lot of thought into buying I usually just go with whatever is priced right and sounds like it would smell good and even by this criteria, the Lady Speed Stick Nutra-Skin would still probably end up in my cart - the price is totally reasonable and it has a fresh new scent that reminds me of apples. Everything stays dry and stink-free and at the same time it really does feel like it's adding moisture to my armpits which I didn't know they needed until I started doing it! For more info go to www.ladyspeedstick.ca and be sure to check out the special offer on SnapSaves - www.snapsaves.com/LadySpeedStickNutraSkin.